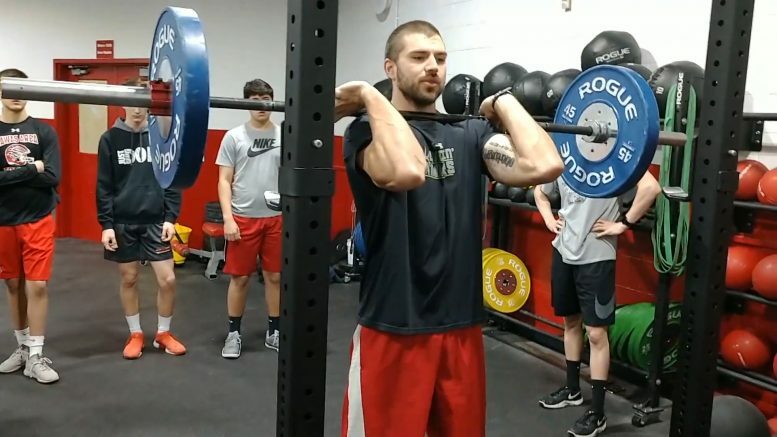 Former Tawas and Green Bay Packers WR Jeff Janis shows athletes how to front squat. Tawas, Mich. — The Tawas football program knows what it takes to build a strong foundation. MMA fighter Chad Herrick has witnessed what hard work can achieve. “The kids that are serious and want to do great and achieve good things, they’re the kids that are in the weight room and putting the extra time in,” said Herrick. In 2019, Tawas graduate Jeff Janis was drafted by the Green Bay Packers as the 236th pick in the seventh round. Herrick remembers when Janis first stepped into the weight room. Janis took his talent from Saginaw Valley State University to Green Bay to catch passes from Aaron Rodgers, like the Hail Mary catch against the Arizona Cardinals in the NFC Division Round on Jan. 16, 2016 that sent the game to overtime. It was a 41-yard bomb. Janis finished the game with seven catches for 145 yards and two scores, far and away his most productive game as a member of the Packers. The Cardinals won the game 26-20. All the hard work began back home in Tawas. Now Janis and Herrick plan strength and endurance workouts for the Braves football team early in the morning at 6 a.m, including Herrick’s son, Lukas, who is a freshman fullback and defensive end. The Herrick family will always remember watching Janis play on the big screen, but his dedication in Tawas will never be forgotten.